Caroline offers a discount of 50% on their first / introductory lesson! 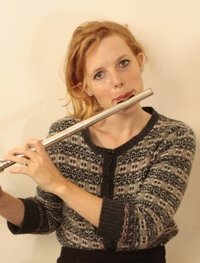 I have over 10 years experience teaching flute and 15 years experience of music performance and recording. I was an original member of the band Bat For Lashes; I then went on to tour and record with Philip Selway (Radiohead). I currently record and play live as a member of Collectress, an all-female contemporary classical chamber quartet. I have over 10 years experience teaching flute, and have also taught beginners' piano and guitar. I am CRB checked and live very centrally within the Brighton and Hove area and am happy to either have students come to me or to teach within their homes. I am a friendly, patient and nurturing teacher who can help prepare you for graded examinations including grade 5 theory (which is the prerequisite for the higher instrumental grades). On the other hand if grades aren't your thing, I can help you get the most rewarding sound from your instrument and help you read music. I am happy to teach all ages, including Primary School beginners who want to start with the fife. I always aim to make lessons fun and engaging, and with younger learners incorporate rhythm games, an introduction to notation, and basic theory.